Joseph Cafasso, a native of Piedmont, Italy, was of humble origins. He was ordained priest in 1833 after studies in the Turin seminary and at the Institute of St. Franics. Father Joseph had a deformed spine which did not hinder his brilliance in moral theology. Two things made him notable of his time: he actively opposed the heresy of Jansenism, and he fought state intrusion into Church affairs. Hence his popularity in teaching. Ahead of his time Father Joseph preached daily Communion and regular adoration of the Blessed Sacrament. Saints beget saints. Joseph met John Bosco in 1827 and the two became good friends. Bosco credits Joseph’s encouragement that led to the latter’s work with boys. The religious institute founded by Bosco was advocated by Joseph who asked benefactors to support. Father Joseph was canonized in 1947. 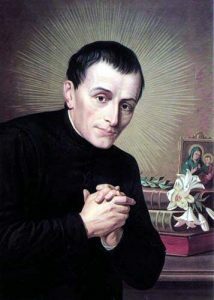 It was Pope Pius XII who declared St Joseph Cafasso the Patron of Italian prisons on 9 April 1948, and, held him up as a model to priests engaged in Confession and in spiritual direction (cf. Apostolic Exhortation Menti Nostrae, on 23 September 1950). May St Joseph Cafasso teach us to be clear in our doctrine, engaged in the lives of the needy, and firm in our love of the Lord through eucharistic devotion. Can we today, imitate what was said of St Joseph’s secret: to be a person of God; to do in small daily actions “what can result in the greater glory of God and the advantage of souls”?